Through this book, The Walking Wounded: The Path from Brokenness to Wholeness, more people will be able to understand about abuse and its devastating effects on its victims. 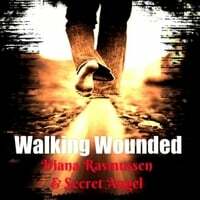 Secret Angel reveals how these hidden wounds begin from childhood and intensify through stages of development, leading to cycles of abuse and victimization... until the cycle is broken. Each chapter includes Secret Angel's true story as she walks through these stages of brokenness until she reaches a point of devastation then continues through her path of healing and restoration. Now, as an over-comer of abuse and domestic violence, Secret Angel is reaching out to help others to also overcome their situations with information and inspiration to see THE LIGHT that led her out of a world of darkness filled with deception and various abuses. God rescued her from abuse when she was so broken that she did not even know that she was being abused. She wants to help others to join her on the path from brokenness to wholeness as she guides the readers though the stages of her own life.